In terms of compact cameras, the Panasonic Lumix DMC-LZ7S is a basic entry-level compact camera that delivers great image quality. If you don’t know squat about manual settings when it comes to digital cameras, the Panasonic Lumix DMC-LZ7S is your perfect companion since it can produce great shots in auto mode, unlike other entry level digital cameras out in the market. ADVANTAGES: Great image quality for a point and shoot digital camera, the Panasonic Lumix DMC-LZ7S is almost comparable to some Digital SLR cameras out in the market and you’re almost always guaranteed of a near perfect shot that doesn’t require any Photoshop editing. 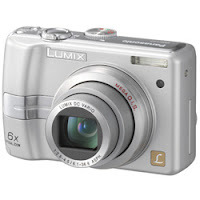 The Panasonic Lumix DMC-LZ7S also has a 6x optical zoom which is quite a lot of zoom on a camera at this price range. Optical image stabilizer on the Panasonic Lumix DMC-LZ7S is also great, if you’re the type who has shaky hands, the image stabilizer on this camera would be a great plus. DISADVANTAGES: Though it is under “compact cameras”, it’s not really that quite compact and the size is bulky, this could be good thing for those with large hands but for those looking for a slim compact camera that can fit on their pocket without showing, the Panasonic Lumix DMC-LZ7S’s size might be a turn off. It uses 2 AA batteries, I don’t know why I’m writing it on the disadvantages but I feel that AA batteries are somehow, a thing of the past. There’s no viewfinder on this camera but if you’re just going to use this for casual occasions, there’s really no need for one. The Panasonic Lumix DMC-LZ7S also cannot zoom when recording movies which is a bad thing if you’re cheap and you’re going to use this as a backup camcorder. Thanks for the review. I got this one over the Casio because of the reviews I've heard about it. It's a pretty good Camera for me. Can you suggest any other digital cameras from Panasonic that's not that bulky? Thanks for the comments. The upcoming Panasonic Panasonic DMC-LS80 is a good choice but I've always preferred Canon's ELPH series for compact digital cameras.